Another recipe thanks to allrecipes.com. 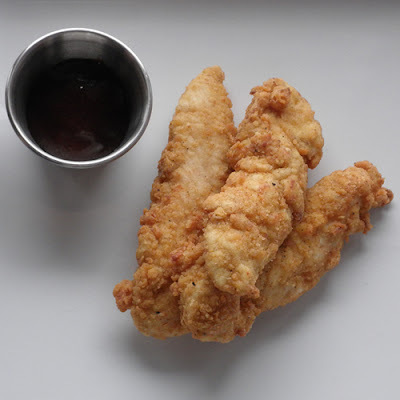 (http://allrecipes.com/Recipe/Breaded-Chicken-Fingers/Detail.aspx) What would I do without that website? These chicken tenders will satisfy your fried chicken craving without spending $20.00 at KFC. No, they don't exactly taste like KFC, but it's tasty fried chicken tenders that you've made yourself. Over the years, I've modified this recipe here and there, and I think I'm ready to put it in writing. Now I'll be able to replicate it myself next time I make it. Place chicken strips into a large, resealable plastic bag. In a small bowl, mix the egg, buttermilk, garlic powder, and cayenne pepper. Pour mixture into bag with chicken. Seal, and refrigerate 2 to 4 hours. In another large, resealable plastic bag, mix together the flour, bread/cracker crumbs, season salt, baking powder, poultry seasoning, black pepper, and MSG. Remove chicken from refrigerator, and drain, discarding buttermilk mixture. Place chicken in flour mixture bag. Seal, and shake to coat. Remove with a fork to a plate, shaking off excess breading. Heat oil in a large, heavy skillet to 375 degrees F (190 degrees C). Carefully place coated chicken in hot oil. Fry until golden brown and juices run clear. Drain on paper towels. I just tried to fry chicken for the first time last night. I scorched one side, but it wasn't too shabby. I think I may have to try this recipe for my next attempt. Thanks!